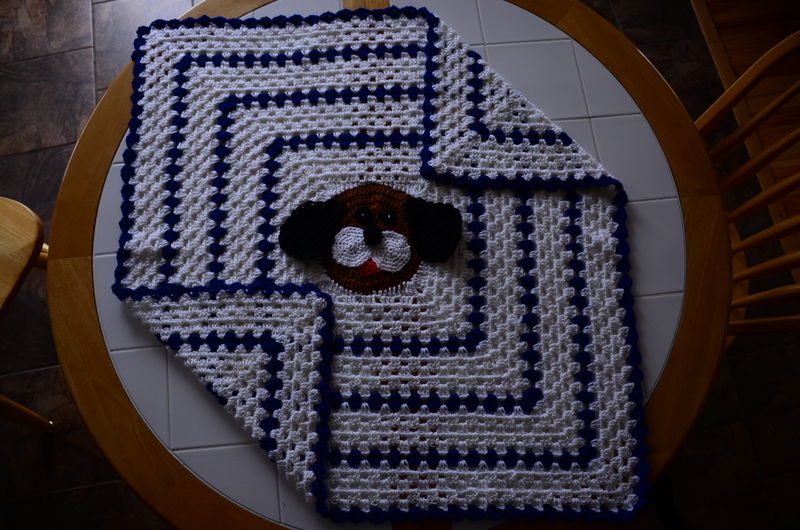 His blanket is finished, and will go in the mail by the weekend. 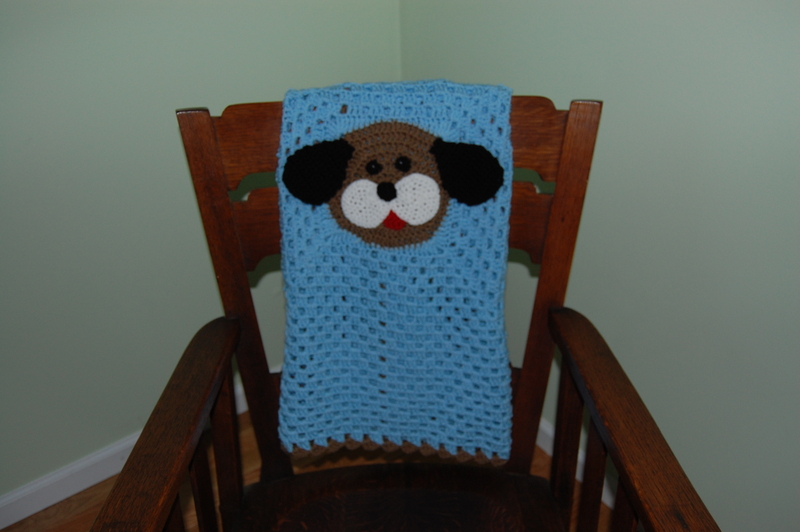 I used Knit Picks Brava worsted yarn and modified this pattern: Puppy Dog Granny Afghan Square by Rhonda Guthrie. 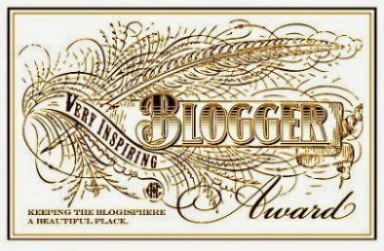 I’ve made this several times. It works up really nice. This pic has shows the whole blanket. 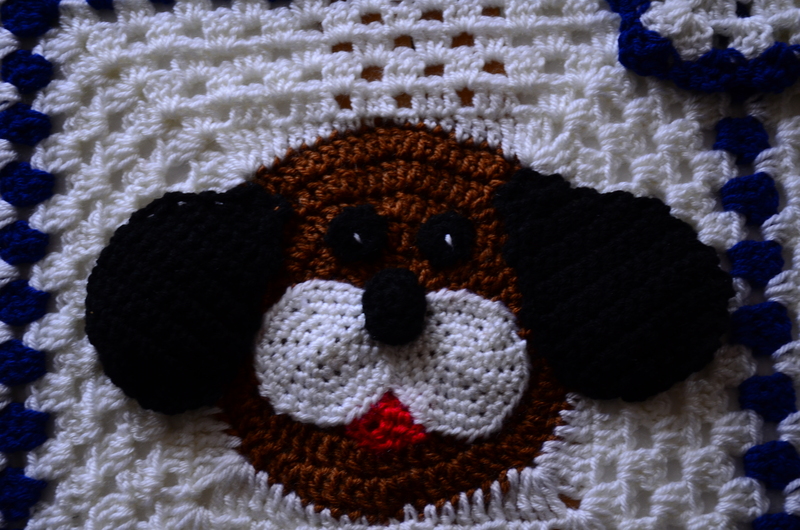 Here is the detail of the dog’s face. My next project will be started tonight. 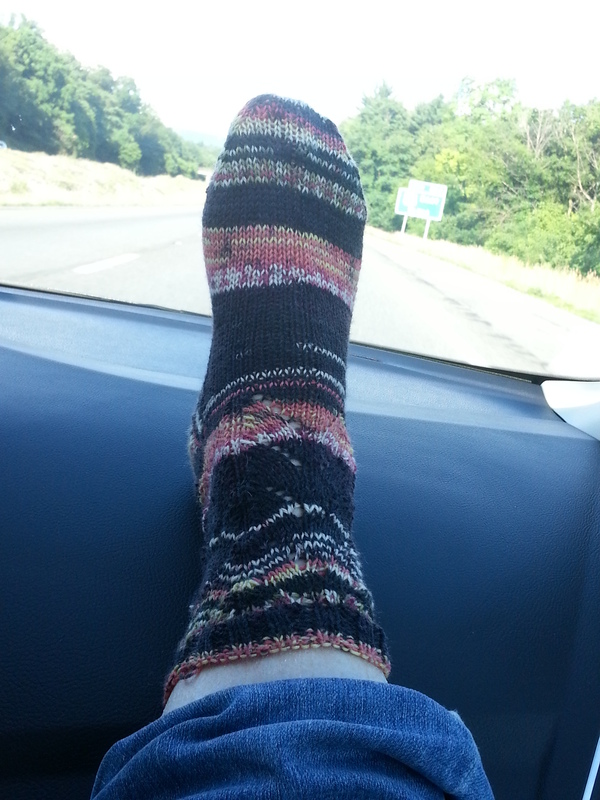 I’m in a sock making mood, so I’m putting down the crochet hooks for a while and picking up my knitting needles. 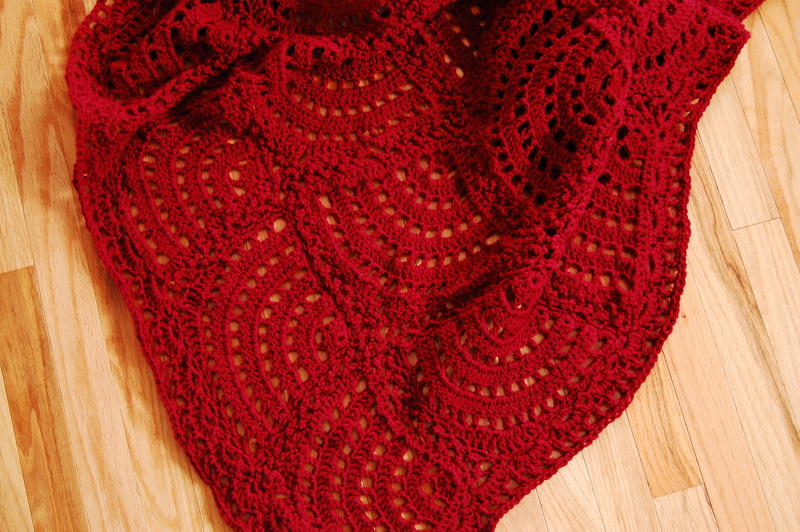 I’ll let you know which pattern and yarn I’ve decided on next week. 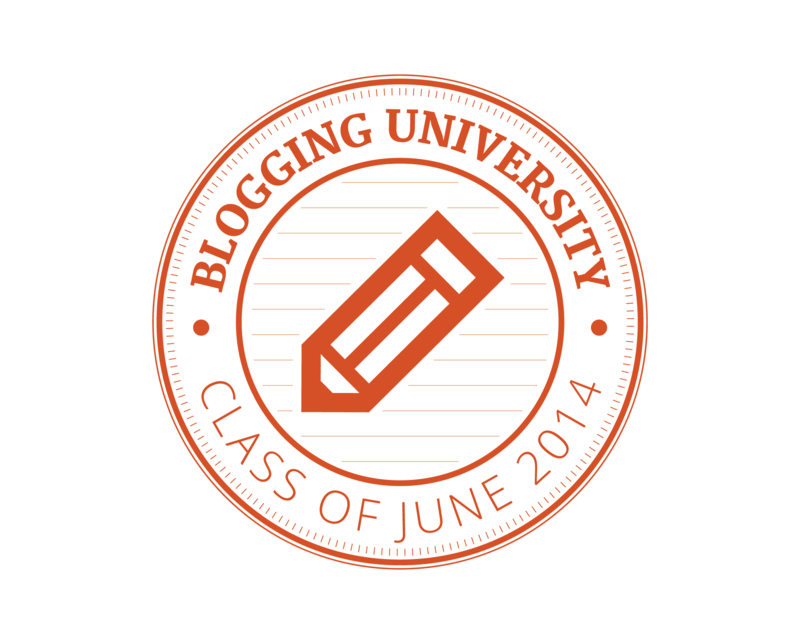 I’ll use something from my stash – which is bulging out of the closet where it lives. Hopefully I’ll make good progress this week while riding in the car on our mini road trip. 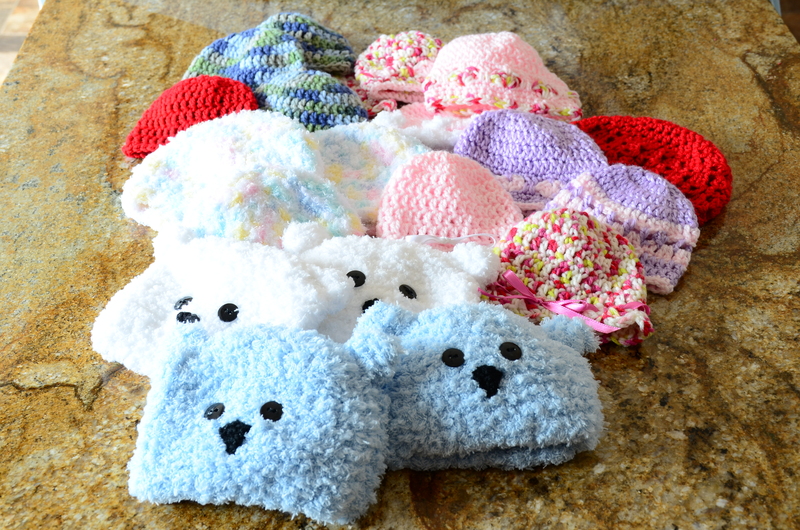 I’ve been busy working on baby hats for the NICU unit this past month. My girlfriend is going to see her sister next week, so I wanted to have some hats completed for her. 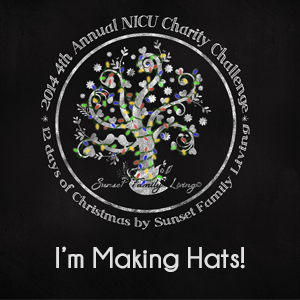 Here are most of the completed hats. 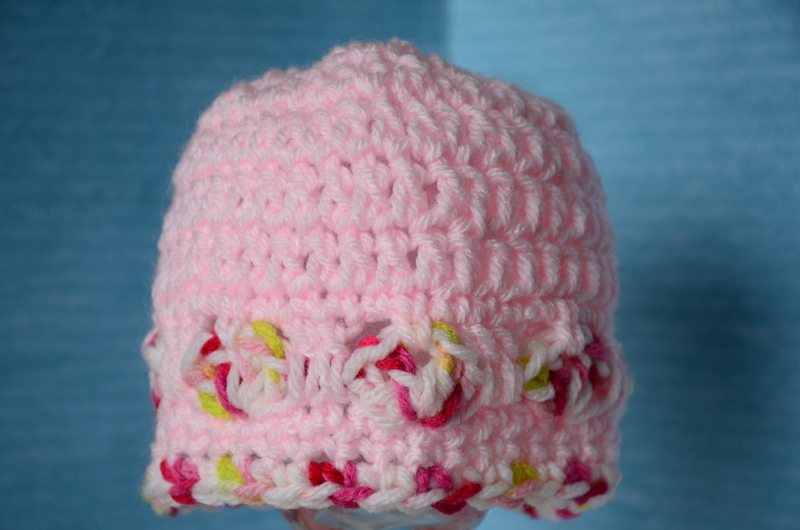 I try and make different sizes and some for boys, girls or unisex hats. I made a few with hearts because Valentine’s Day is coming up soon. 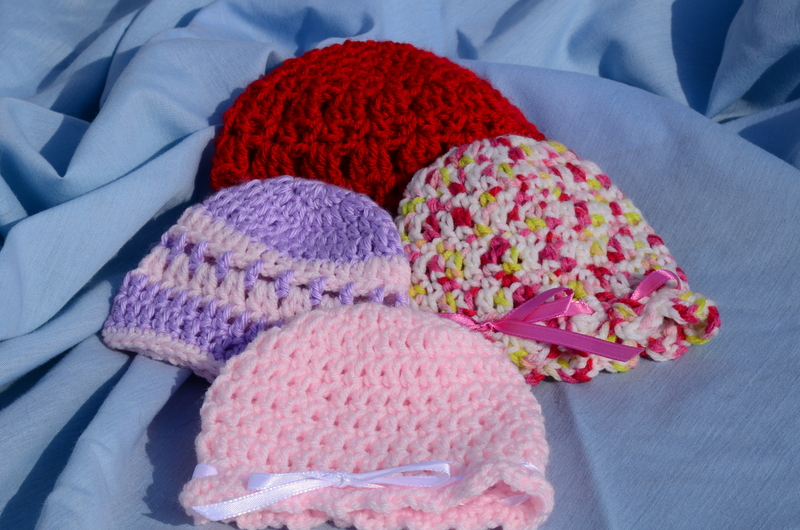 And a made a few plain hats and girlie hats. 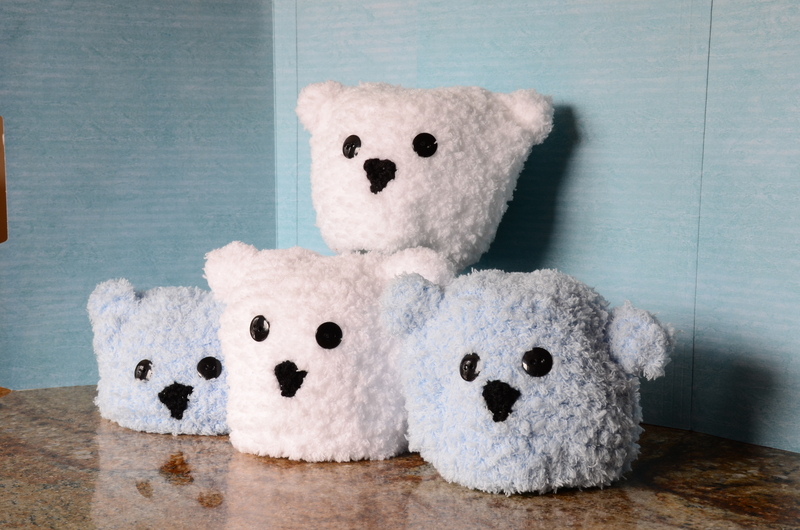 Each one takes less than an hour to make. 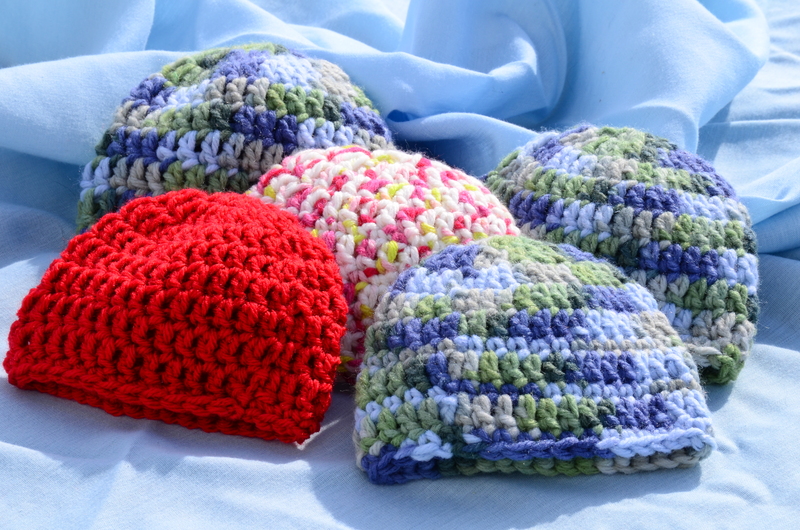 It is a great way to put good use to your stash (you know you have bits of yarn left from other projects just crying out to you. 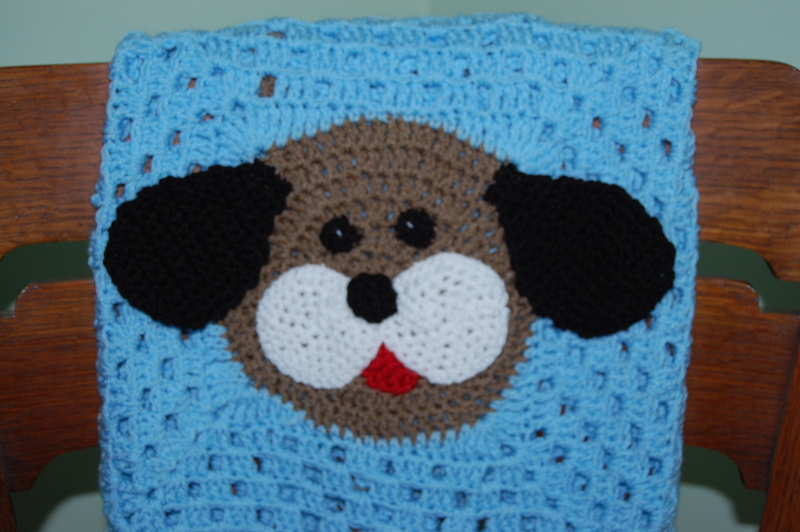 There are ones of free patterns on Ravelry and other places on the internet. 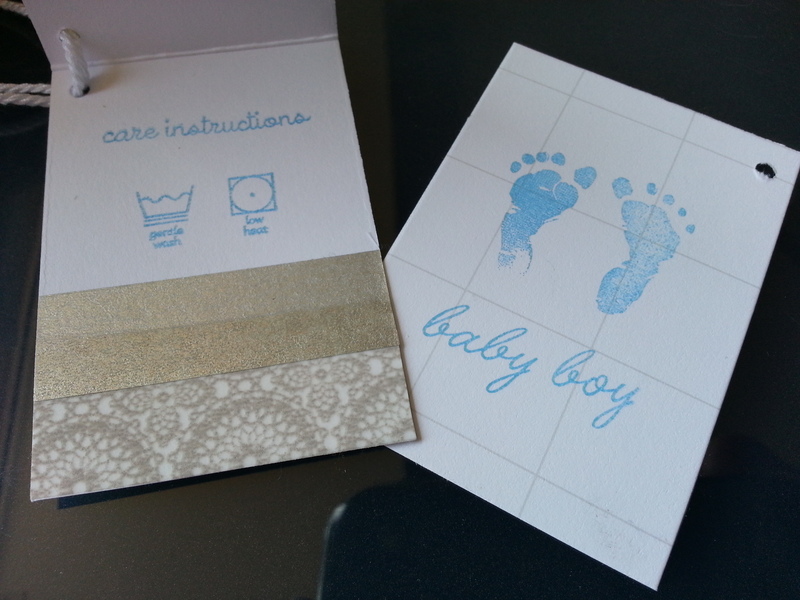 After you make a few, it is easy to follow the basic shape and create your own patterns. 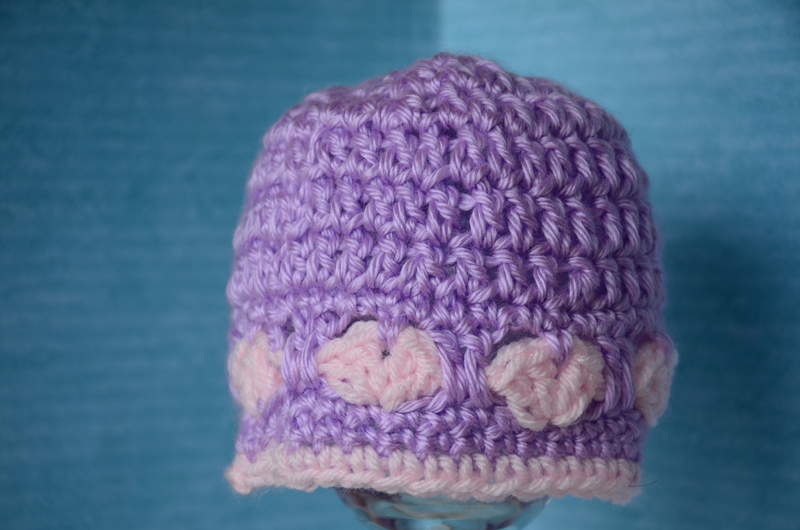 Next month I will have a bunch of bunny hats ready to sent to the NICU unit for Easter Morning. 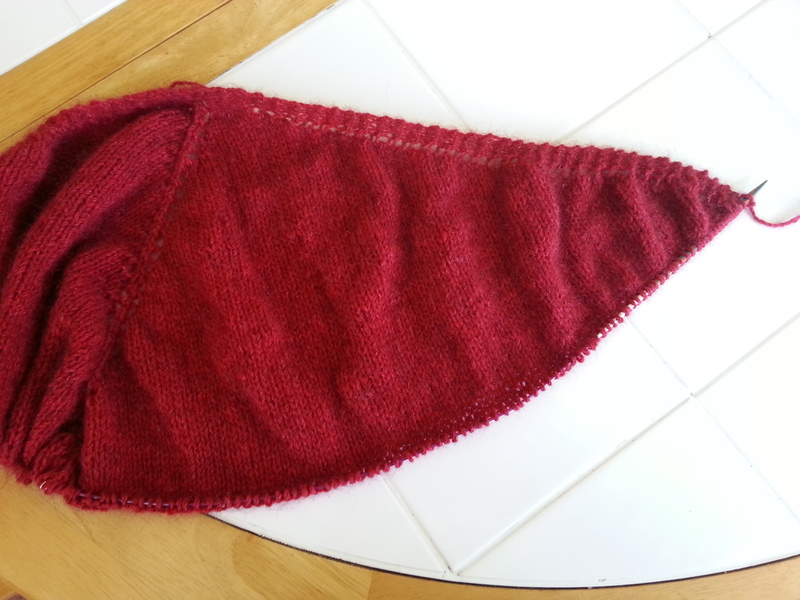 I have a bag of ears done and a few of the actual hats already. My sweater is still as it was – sleeveless. 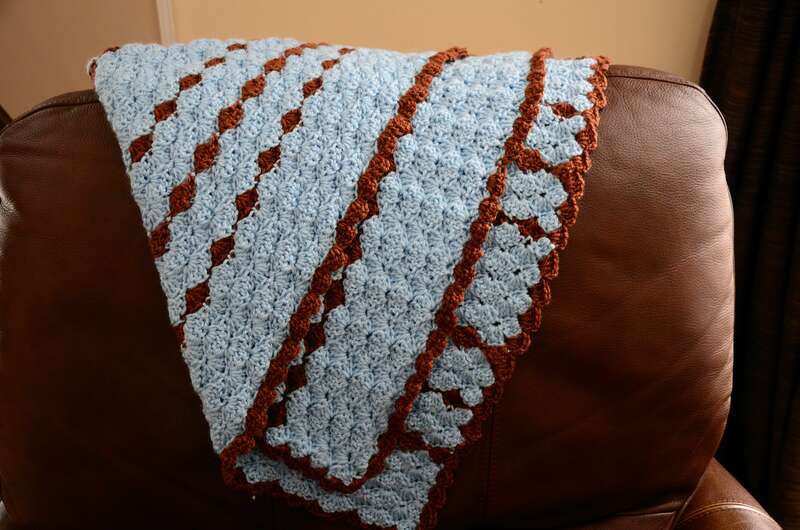 I’ve finished the baby blanket for the gal at work. 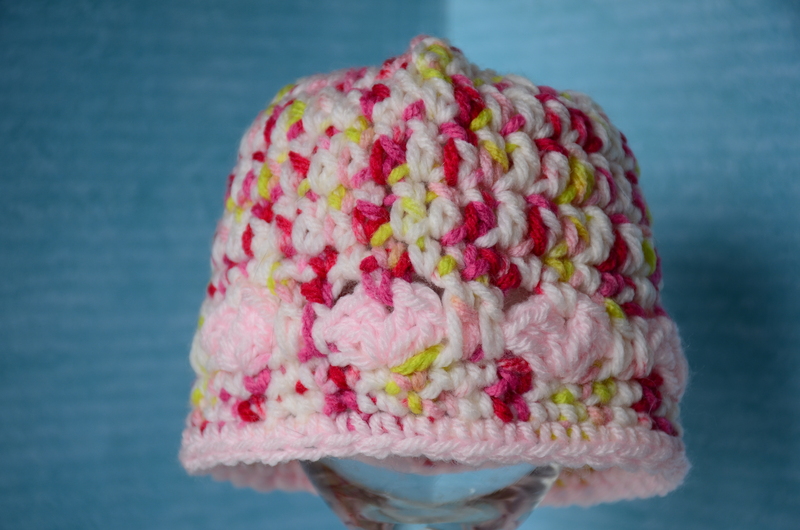 She chose the colors, I used my go to crochet pattern from Bev’s Country Cottage, Baby Shells. It is quick, easy and always turns out well. 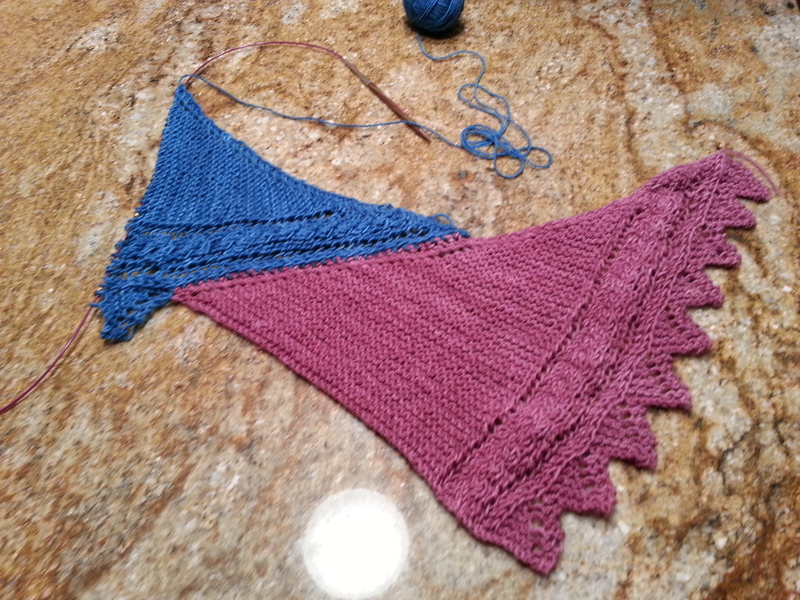 Again I went with an acrylic yarn, Knit Picks Brava worsted for easy cleaning. 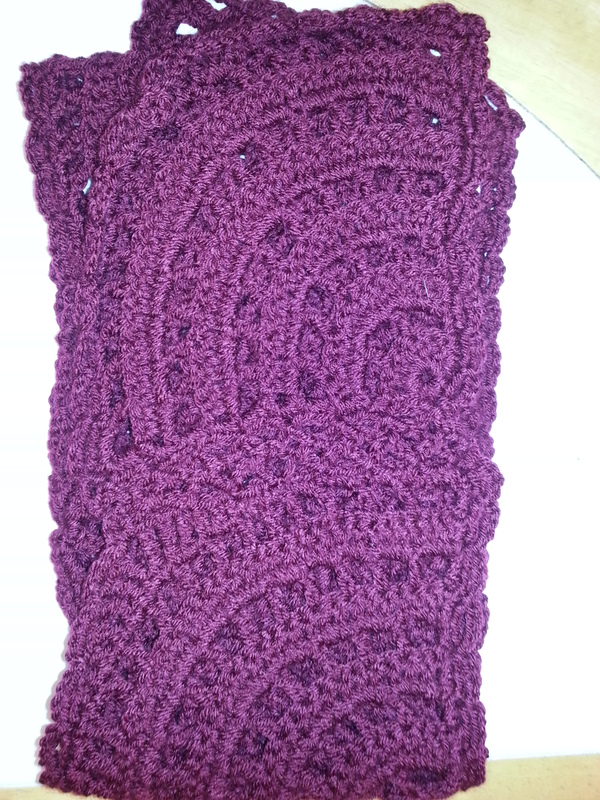 Next, I worked on my helix scarf and think it is coming along nicely if I do say so myself. 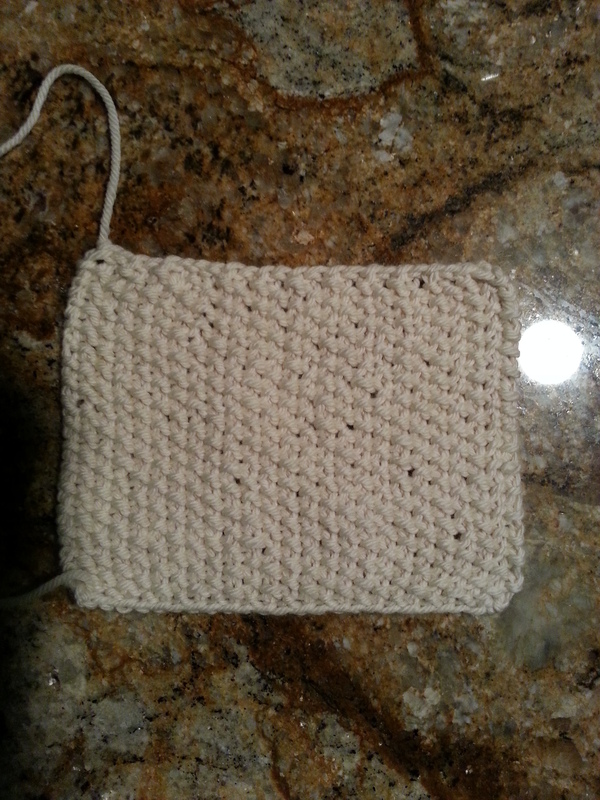 And finally I finished the seed stitch square for the Master’s Program. 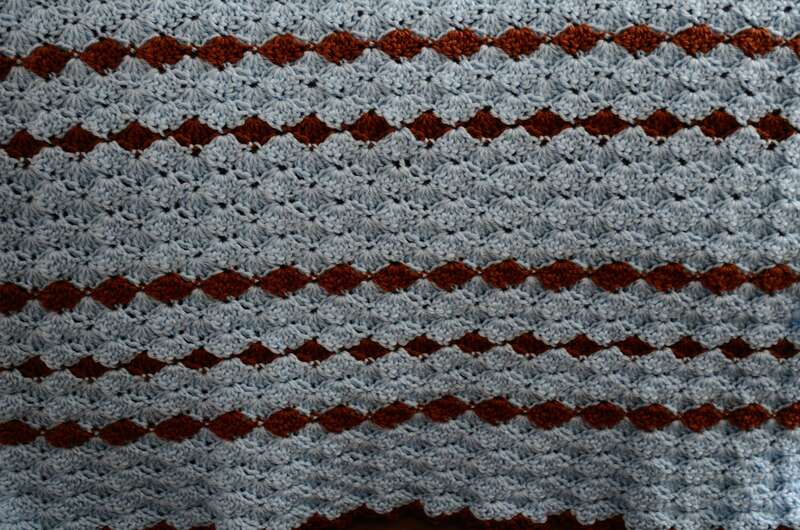 Hopefully next week you’ll see the completed throw. To keep myself on task a weekly report on my 2013 projects seemed like a good idea. I was going to call these posts WIP Wednesdays but that seemed too ordinary. So Whatcha doin seemed to be more in order. This week has been productive project week for me. 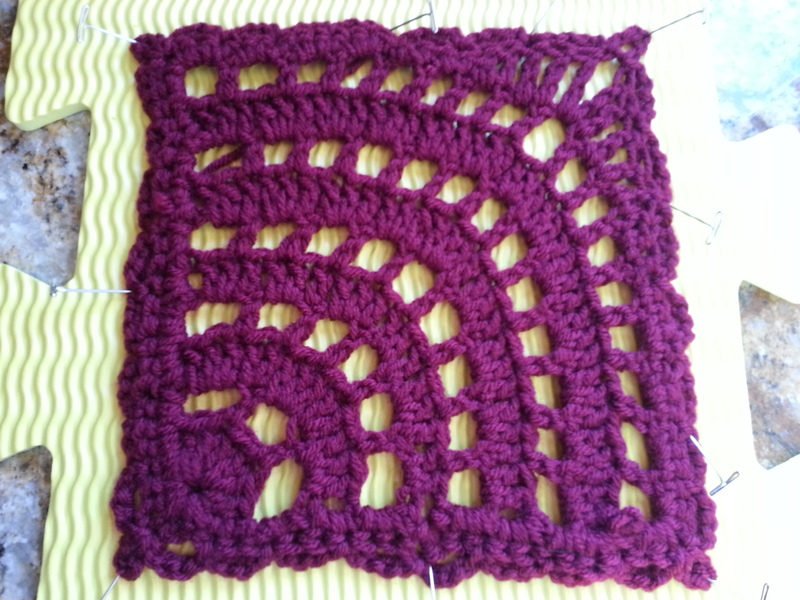 I haven’t taken pictures of the two projects I am working on except this one of the first square for the Spiral Fan Throw I am making for my girlfriend’s birthday. So far I’ve completed 14 of the 35 squares and have them in two strips of 7. I only have 3 more strips and the edging to complete, so feel fairly confident that this project will be completed in time for her birthday. 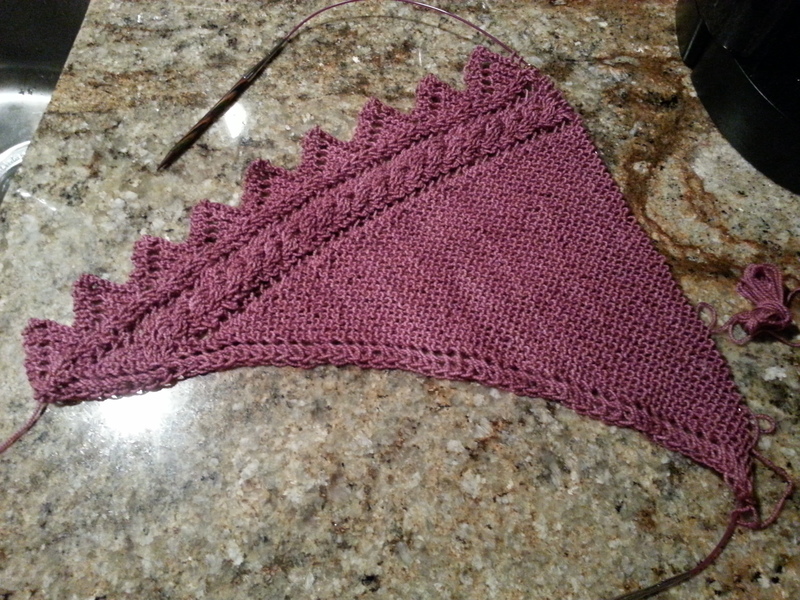 I’m using Brava Worsted from Knit Picks in Wine. 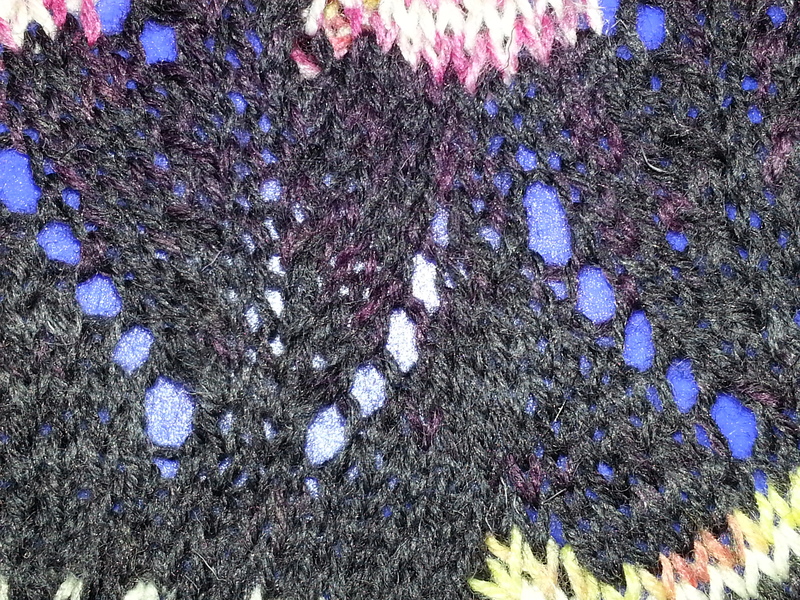 I really love the feel of this yarn and the way it works up. 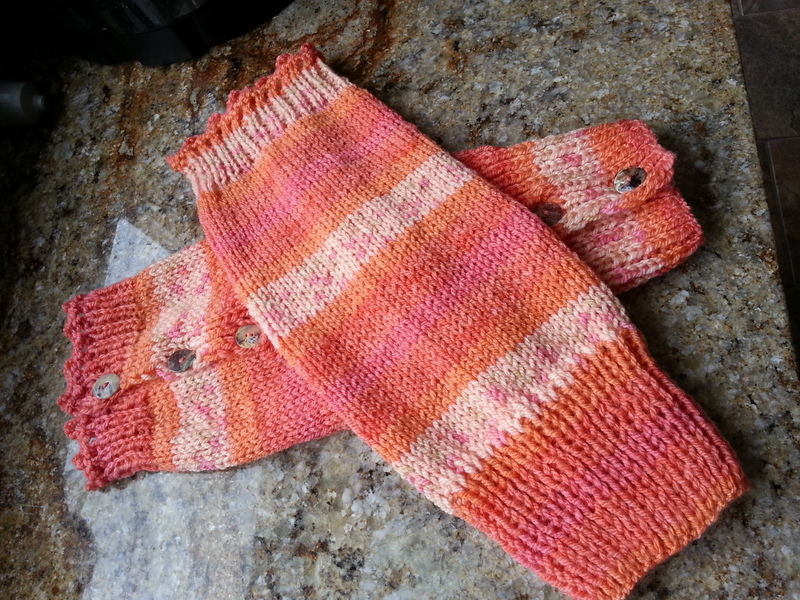 It is soft and feels as though it will be really warm and cozy. 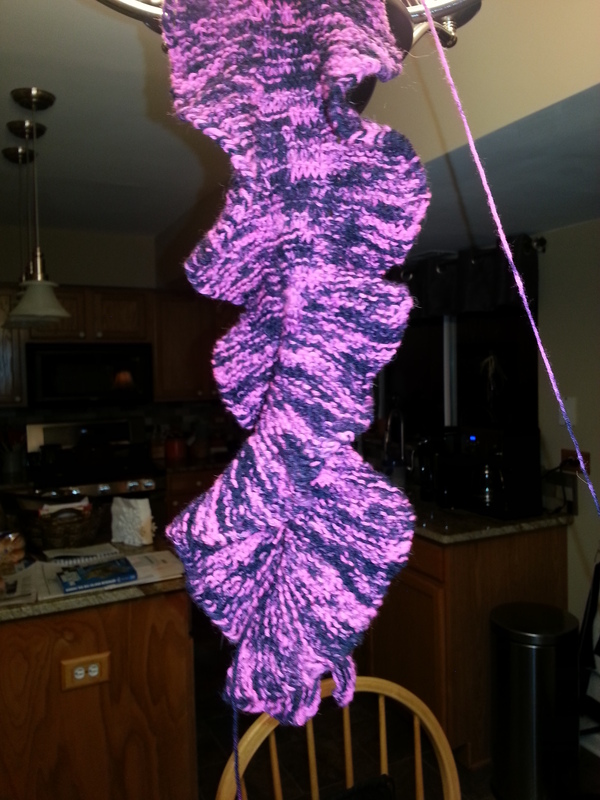 My knitting project is a helix scarf I am making for myself out of the bison yarn I purchased at Stitches Midwest. 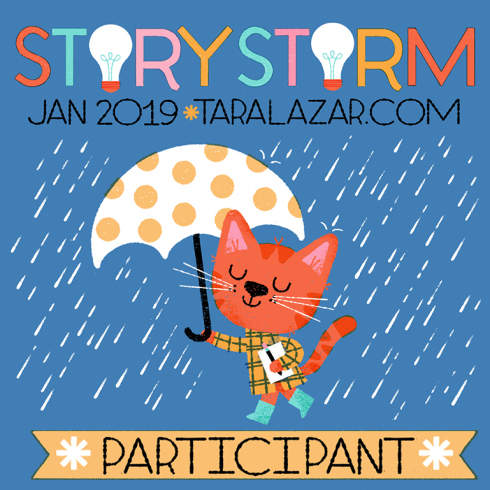 I was encouraged to start this project first by my friend. 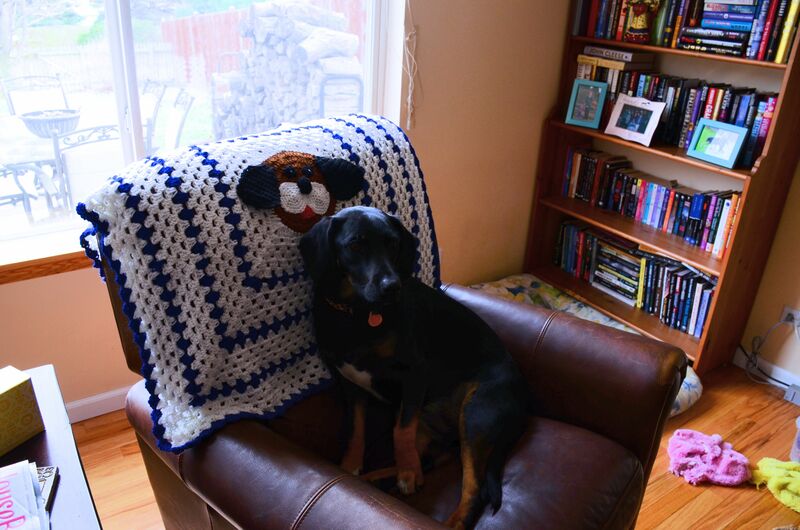 She was with me when I purchased the yarn and was anxious to see how it would work up. It has the feel of cotton even though it is 90% super was merino and 10% American Bison. It is the hot pink and black hank in this picture of all of the yarns that I purchased at Stitches. 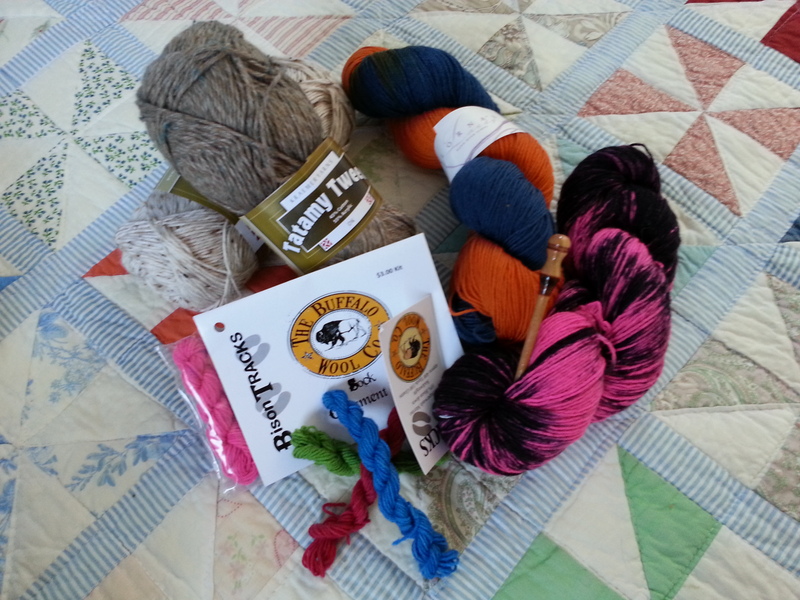 As a sidebar – I have used almost all of the yarn pictured here. 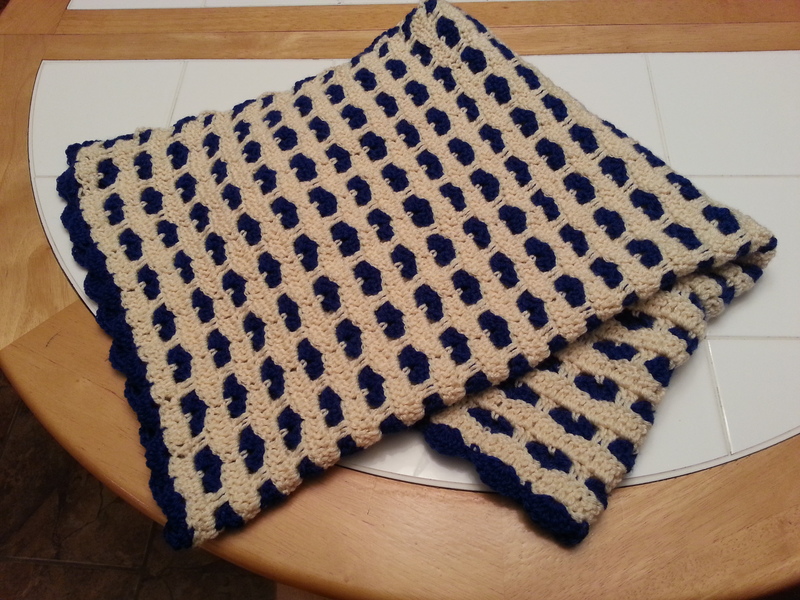 The blue and orange is now a scarf made for my son’s girlfriend. Go Bears!! 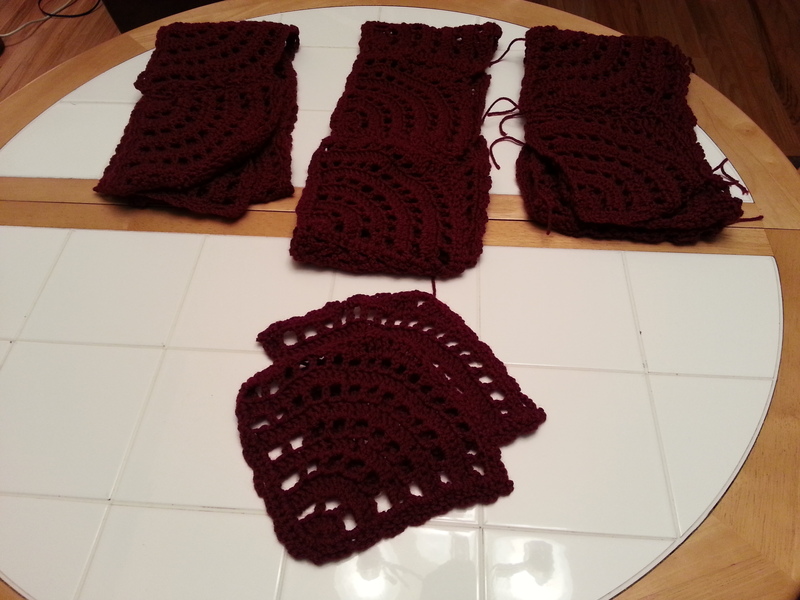 The two at the top – the brown and beige variegated – are now a washcloth for my girlfriend for Christmas and several dishcloths for our kitchen. The only thing here that is still in my stash are the three little twists of bison yarn. They came with a pattern for cute little Christmas stockings. 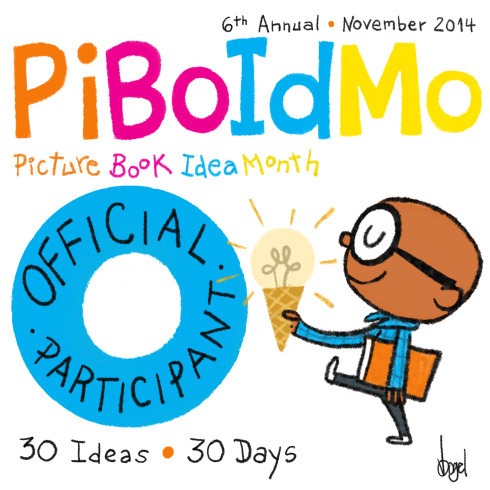 This is inspiring me to add those 3 little projects to my list of things to do for Christmas 2013.